You're as strong as the tools you're working with, your partners! Greson Tools is helping you overcome the barriers of owning and maintaining heavy machinery and tools. Meeting the toughest demands in fencing, Greson tools is ready to complement your business needs. Whether is a public event or construction site, we are there when you need us offering the best fencing solutions. GRESON EASY LOO LTD is a company specialized in the supply of portable toilets, and more specific in the field of sales, rentals, repairs and general maintenance. We are able to provide toilets for every project or event you may need, such as construction sites, weddings, outdoor parties, concerts; as well as public areas like beaches, parking places, parks, schools, campsites and army. Greson Tools offers prefabricated modules that can be used singly, coupled with other modules to form several space solutions even two or three-storied, and flat packed to minimize transport costs. 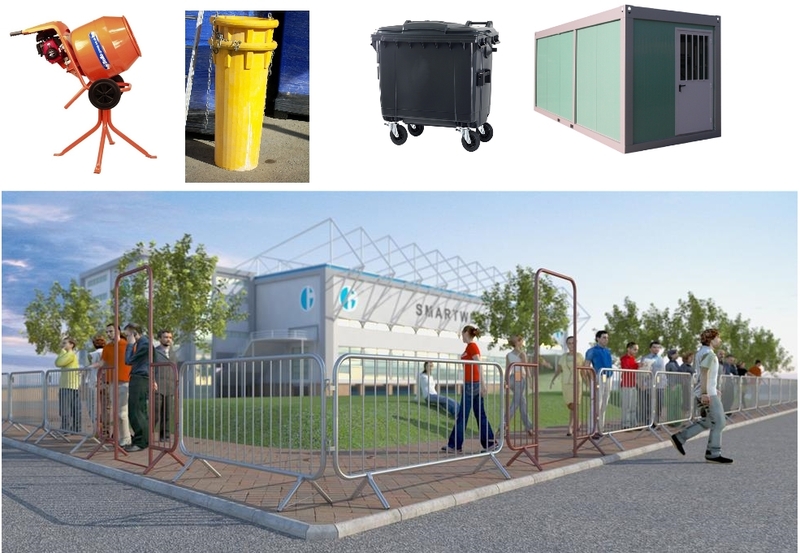 Greson rubbish chutes provide a safe and easy way to remove any waste from various levels of building or construction sites into a skip or waste container. Made of durable polymer material will last for many many years. Greson offers an advanced range of mixers that adds even more durability to the proven Premier mixers. To match site requirements four drum sizes are available to give different batch mixing capacities. All sizes share the same advantages built in as standard. Wide range of solutions in terms of power supply: electrical, petrol or battery operated Lightweight instruments, easy to use and carry. Durable made to withstand rough conditions. Ideal for the internal compaction of concrete specimens both in laboratory and in site, and a good alternative to the traditional tamping bar especially when there are large number of specimen to be compacted. Our selection of trench rammers are designed with forthcoming environmental legislation, performance and durability in mind. We carry a selection of Accessories to compliment the Compaction Equipment we offer. Items range from Paving Pads to Transporter Wheel Kits for the Compaction Plates and various sizes of Tamping Feet for the Rammer range. Greson tools offers a complete range of road breakers, pick and chipping hammers, rock drill hammers.Durability, Strength, Power and aftersale service is what differentiates us from the rest of tool sellers. Hydraulic breakers are not meant to have an easy life. Greson Tools offer Hydraulic Breakers that combine efficiency, reliability and serviceability.Excellent power-to-weight ratio Unique gas-charged piston maximizes hydraulic hammer efficiency. Greson tools has an exclusive collection of rubber tracks and tyres for mini-excavators and skid loaders. Our tyres and tracks are of superior quality and last longer than competitive brands.